In medieval times, most people grew a percentage of the food they ate. Vegetables were mainly grown in a medieval garden but especially important was the growing of herbs and flowers as these were used not just for cooking but also for medicinal purposes. Herb gardens are still popular today, principally because of their intrinsic importance to our medieval ancestors. The diet of the average medieval peasant was very bland, the daily fare being pottage (broth made with vegetables and pulses and, if available, meat), served with bread. Adding herbs made the pottage more palatable and strong tasting vegetables were also used for the same reason. The best and most bountiful gardens were found within the grounds of medieval castles. 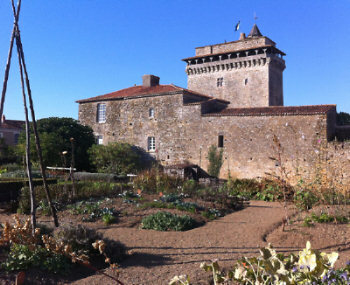 The garden in the photograph (left) is in the grounds of a French medieval donjon. Still lovingly maintainted today, it is full of herbs, flowers and fruit which are used by a nearby restaurant for gourmet cooking. Medieval monasteries also had their own, often extensive, gardens. The monks had to be self-sufficient in supplying their own food of course but they also offered medical treatment for the local community using herbs and poultices made from what they grew. So tending the monastic garden was a serious task absorbing a lot of time and energy from the monks and sometimes resulting in the monastery hiring in lay gardeners. Many monastic gardens also included a fish pond where they would farm their own fish and eels.